Team up your favorite pressure feed gun with our QualSpray Pressure pots and cups. A Homestead exclusive, we’ve put these pots through the paces and found them to be rugged and dependable. 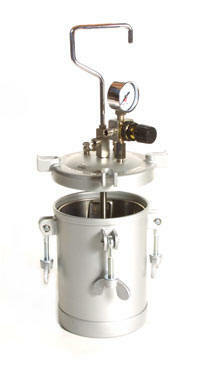 All pressure pots are tested before shipping and come complete with setup, use and troubleshooting instructions. For hoses and fittings click here. 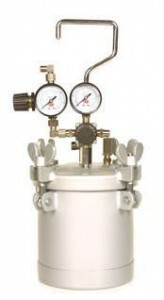 Pressure pots are available in standard construction or all-stainless where the situation requires it. NOTE: When waterborne products are left in a non all-stainless pressure pot, you may experience corrosion in the tank lid. This is unavoidable. If you perform diligent cleaning after using waterbornes and do not leave the product in the tank, it should not be a problem. However, if corrosion is an issue, we recommend you consider all-stainless steel tanks. 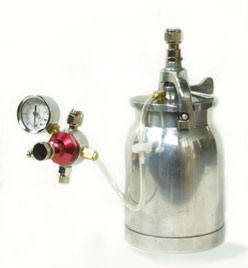 QS-32 This 1 quart pressurized cup converts any pressure feed gun to a pressurized cup feed. If you have a standard siphon feed or remote pressure cup feed gun, convert it with this pot to spray thicker finishes or increase finish delivery rates. Polished aluminum cup, brass pickup tube and single regulator with check valve included. Not recommended for frequent spraying of acid catalyzed finishes. QS-64T This economical pot is a great way to get into remote pressure feed spraying. The lightweight design and narrow mouth make is well-suited for holding in your hand or slinging it from your belt with the hook. Features a lockable, heavy duty regulator that is better and more accurate than our old QS64A and other similar 2 qt pots. Features a recessed check valve assembly for easier cleaning and maintenance, shut off valve on the fluid outlet, and the solvent proof rubber gasket has more “give” than the hard white gaskets found on similar pots at this price for better sealing. Works with all finishes but is not recommended for frequent use with acid catalyzed finishes. (see the QS-64TSS or QS-64ES below). QS-64ES With this rugged pot you’ll upgrade from the 2 qt pots above to a wide mouth and easier clamping system. We’ve also designed in stainless steel where it counts, on the pickup tube and the fluid outlet. No up-charge for stainless steel fittings! This gives you stainless for all wet parts so it’s the best for water base, catalyzed and other corrosive finishes that attack brass and aluminum. Your choice of single or dual regulators. An all-stainless version is available for those situations that require it. 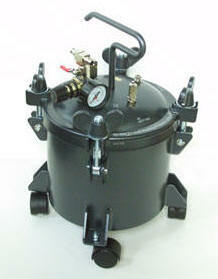 QS-64ESD – 2 quart, dual regulated pressure pot. QS-128S This rugged pot quickly became our favorite pressure pot here at Homestead. If you want the ruggedness of a 2 gallon pot but can’t justify the size, this is the pot to get. Great features include stainless pickup tube and fluid output and large wing nut clamping system. Stainless inner pail is removable for easy cleaning. Features a heavy duty self-relieving regulator for precise control. Works with all finishes and is highly recommended for water base and catalyzed finishes. Pot is wide enough to place a 1 quart finish can inside. Pot available with air agitator. QS-288/QS640 The QualSpray™ 2½ and 5 gallon non-ASME pot is our most rugged and feature packed pressure pot. It’s wide opening allows you to put a gallon can of finish inside. The tank body comes with casters, and large wing nuts make it easy to seat the top to the body and its low, squat design is virtually tip-over proof. Item is shipped with our own supplemental instructions for goof-proof setup and maintenance. 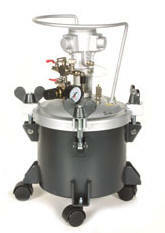 Pots available as single or dual regulated and with an optional air agitator. When you need rugged dependability this is the pot to get. The QualSpray™ 2-1/2 gallon pots are available with an air agitator built in to agitate finishes (photo right). Same quality features as above, it has an air motor with regulator, stainless steel stir shaft and a tough nylon blade. Compatible with all finishes, including acid catalyzed lacquers and varnishes. You won’t find a better price if you compare this pot feature to feature with the competition! QS-640 The QualSpray™ 5 gallon non-ASME pot has the same great features as our smaller 2-1/2 gallon. It fits most of the popular 5 gallon metal and plastic pails. 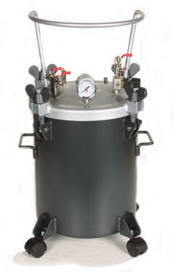 * All 5 gallon pots have stainless inner tank liner, fluid pickup tube and fluid outlets (2). The tank body comes with casters, and has side handles to make it easy to pick up. Large wing nuts make it easy to seat the top to the body and its low, squat design is virtually tip-over proof. Item is shipped with our own supplemental instructions for goof-proof setup and maintenance. 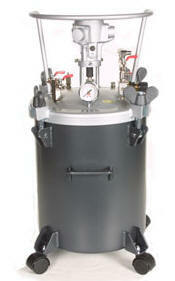 Pots available as single or dual regulated and with an optional air agitator. Pots feature dual fluid outputs and refill inlet. * Inside bottom tank dimensions 15-1/2″ H x 12-1/2″ W.
The QualSpray™ 5 gallon pots are available with an air agitator built in to agitate finishes (photo right). Same quality features as above, it has an air motor with regulator, stainless steel stir shaft and a tough nylon blade. Compatible with all finishes, including acid catalyzed lacquers and varnishes. You won’t find a better price if you compare this pot feature to feature with the competition! #QS-640AD (same as above but 5 gallon, dual regulator, air agitator) Fits most 5 gallon pails.